Again, we’ve had a few days with temps around 50, so I’d really expected to see more bees flying around and have seen, well….none. I have my first Master Beekeeper class tonight, so the hubby fed into my worries and said maybe I should check on the bees first (therefore, I’d have something to talk about). So, I did. And they’re all gone. Both hives. Damn. I’m not as devastated as I imagined I’d be when I lost a first hive. I think it’s because I’m so confused and want to know what happened. It’s possible they starved. I found honey in both hives, but if the bees were too far away from it (i.e. on the other end of the hive), they might not have had the energy to get back to eat. I did find some dead bees head first inside the cells–which means they died eating/trying to find honey. But I’m considering the more likely theory that they were too wet and cold. The insulation that I so wisely put on top of the hives was wet underneath which means it was trapping moisture. There’s a spot at the ends of the roof to let out moisture & it was not blocked but the outside of the roof, itself, was wet. The top bars were dry, though, so the inside of the hive wasn’t wet. I’ve closed the hives back up for now because I have to leave for class in half an hour, but tomorrow I’ll be out to go through everything and see if I can figure out what happened. 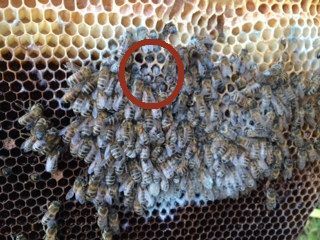 Anita at Beverlybees has a great article about how to autopsy your hive which I will be studying tonight. Dead bees in a puddle of honey. Sad. 2 Responses to Oh, the Beemanity! So sorry. Are you okay? You’re so thoughtful, Kim. Yes, thank you. I got some appropriate “awww”s at tonight’s bee meeting. Everyone knows it happens. Sometimes it’s your fault. Most of the time it isn’t. My instructor even insisted that the 2nd year is always the hardest, which was heartening to hear. Looking forward to learning a lot when I take everything apart tomorrow. Fresh start this spring!